Jordany Valdespin had a pinch-hit three-run homer off Jonathan Papelbon in the ninth inning for his first major league hit, leading the New York Mets to a 5-2 victory over the Philadelphia Phillies on Monday night. David Wright hit a tying two-run double off David Wright in the sixth, and New York won its third straight game. The injury-plagued Mets placed shortstop Ruben Tejada on the disabled list before the game and saw catcher Josh Thole go out after getting elbowed in the head during a collision at the plate. Valdespin, called up to replace Tejada, was 0 for 6 before hitting a drive way out to right off Papelbon (0-1). Tim Byrdak (1-0) retired the only batter he faced to get the win. He struck out pinch-hitter Eric Kratz to end the eighth with a runner on third. Frank Francisco finished for his eighth save. Roy Halladay bounced back from his worst start in five years and took a one-hitter into the sixth before getting in trouble. Halladay allowed two runs and five hits in seven innings, striking out seven. The only batter he walked score. In a 15-13 extra-inning loss at Atlanta last Wednesday, Halladay gave up 12 hits _ one below his career high _ and eight runs in 5 1-3 innings. The two-time Cy Young Award winner had a 6-0 lead going into the fifth before surrendering six. Halladay left the team the next day for personal reasons. 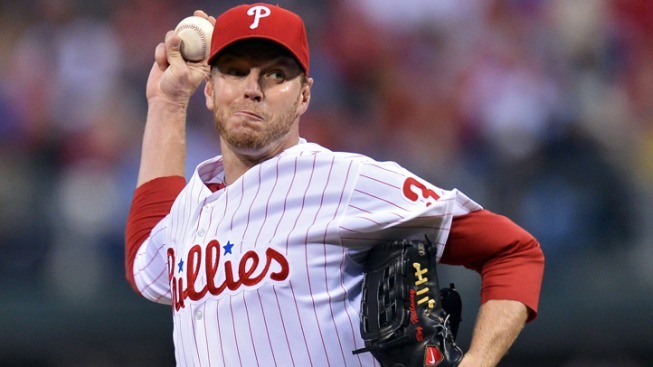 Halladay had retired 13 straight before running into two-out trouble in the sixth. Andres Torres walked and Kirk Nieuwenhuis hit a single. Wright followed with a grounder just over the third base bag. The ball kicked off the foul stand and bounced into shallow left field, allowing both runners to score. Mets starter Jonathon Niese allowed two runs and four hits in five innings. The Phillies loaded the bases with one out in the seventh and had runners on second and third with one out in the eighth _ both times against Bobby Parnell _ and didn't score. Shane Victorino was called for interference because he slid out of base line to take out shortstop Justin Turner on Hunter Pence's grounder to second, and the double play negated a run and ended the inning. Ty Wigginton was thrown out trying to score on Freddy Galvis' tapper to the mound in the eighth. Thole went down after taking a shot to the head and had to leave the game. Byrdak replaced Parnell and fanned Kratz. In the top of seventh, Ike Davis hit a hard liner off Halladay's right thigh for a single. Halladay waved off a trainer and stayed in to finish the inning, getting help from left fielder John Mayberry Jr.'s second diving catch of the game. Mayberry's sacrifice fly in the first gave the Phillies a 1-0 lead. Jimmy Rollins led off with a line-drive double to right-center. He reached third when Torres bobbled the ball for an error and scored on Mayberry's liner to center. Placido Polanco hit an RBI double in the second.